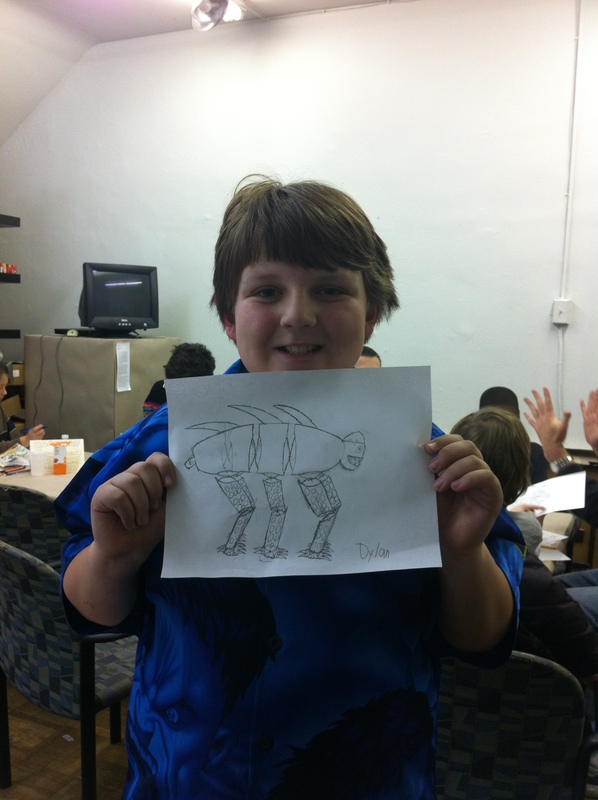 This past Saturday I travelled to Pittsburgh to lead a 3-hour cartooning workshop with Andy Scott at the community space for arts and technology, Assemble. Have a look at the goings on. It was a blast. One of my favorite things to do is to make comics with kids. They know what’s up. To get into the nitty gritty about the workshop, Andy and I facilitated three primary activities. To cover the basics and to make sure that kids didn’t feel much pressure regarding their drawings, we has a station dedicated entirely to covering the step by step construction of cartoons. Andy and I provided materials that would allow them to draw both famous characters and entire simplified worlds a la Ed Emberley. 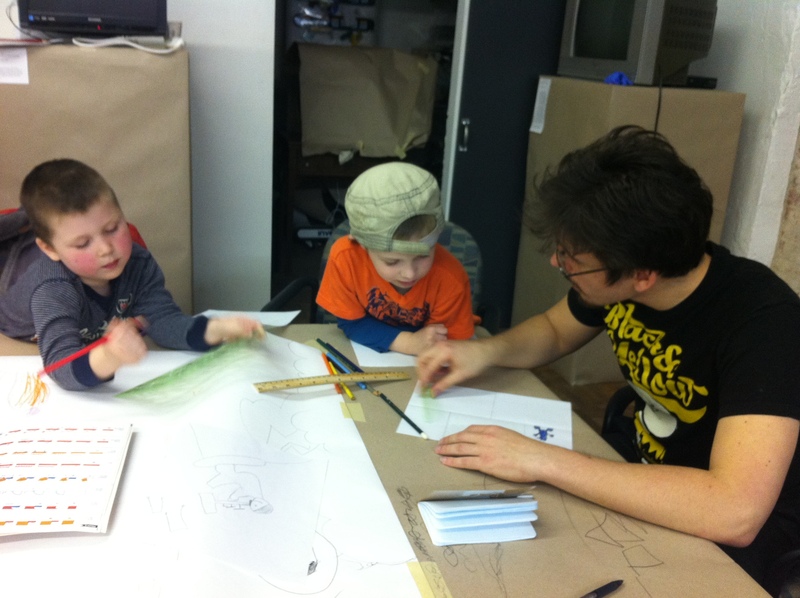 The kids would have the opportunity to copy them by sight or by using tracing paper. I wanted to make sure that we harped on copying as a positive learning tool and not as something to be ashamed of. I know first hand how empowering it can be to know how to draw a character that you see on tv and on billboards. In my mind, an activity like this one would allow the kids to go home having nailed down Homer Simpson or Sponge Bob, a brag worthy skill that’d be a great boost to their self-esteem. 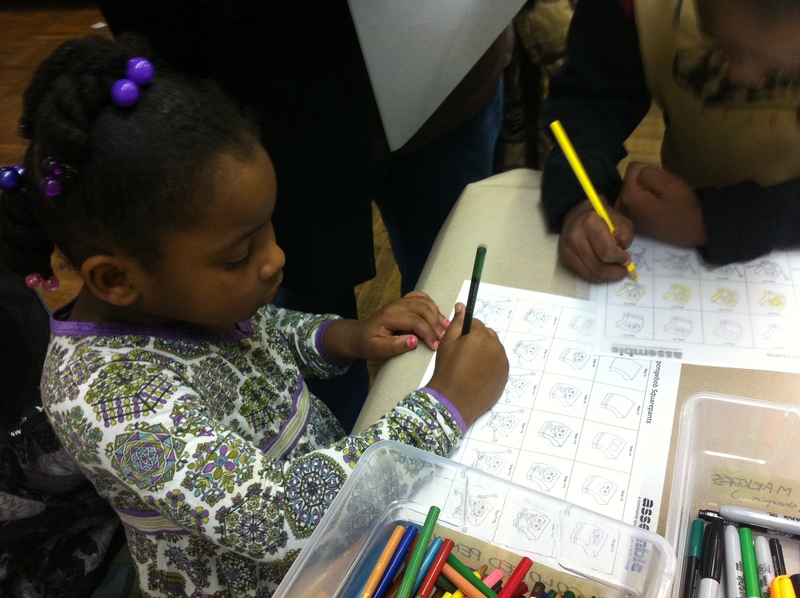 Besides step by step cartooning, we set up a self-portrait station, where kids were encouraged to draw themselves as animals, robots, bugs, superheroes or their favorite household items. These drawings would then be used to create a poster design for the following week’s Crafternoon. In addition to that there was a large collaborative megacomic on a massive sheet of butcher paper. For this megacomic, Andy laid down a basic structure of frames, a couple of “meanwhiles” and “BUT”s and a few city skylines. After that, we let the kids go to town, encouraging them to take the stories to the outer limits of believability. 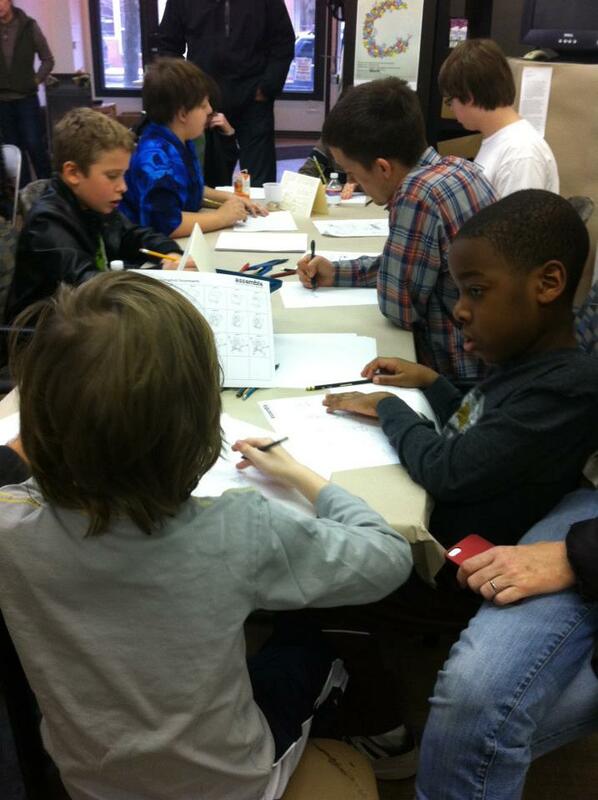 Of course, given that the space is oriented towards drop-ins, kids were welcome to follow their cartooning muses in any way they pleased. 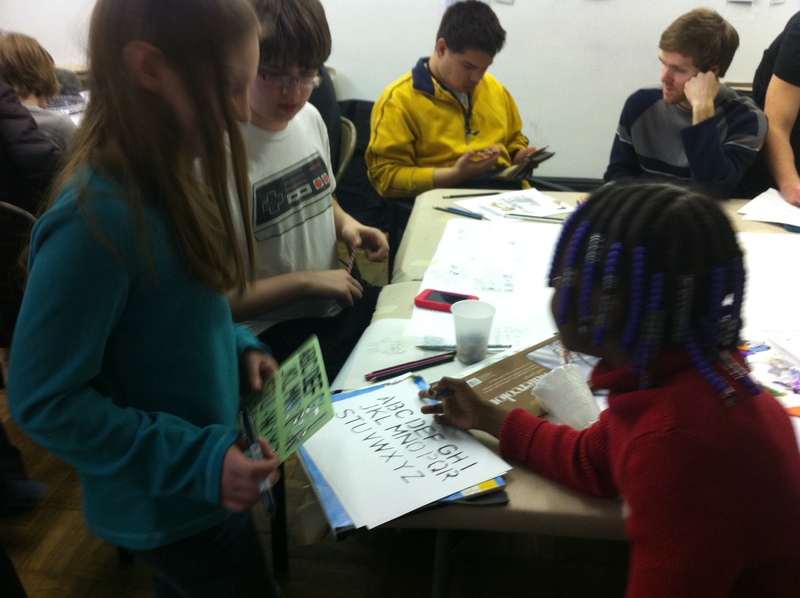 Some kids wanted individual attention, so I spent time with many of them making one sheet minicomics. 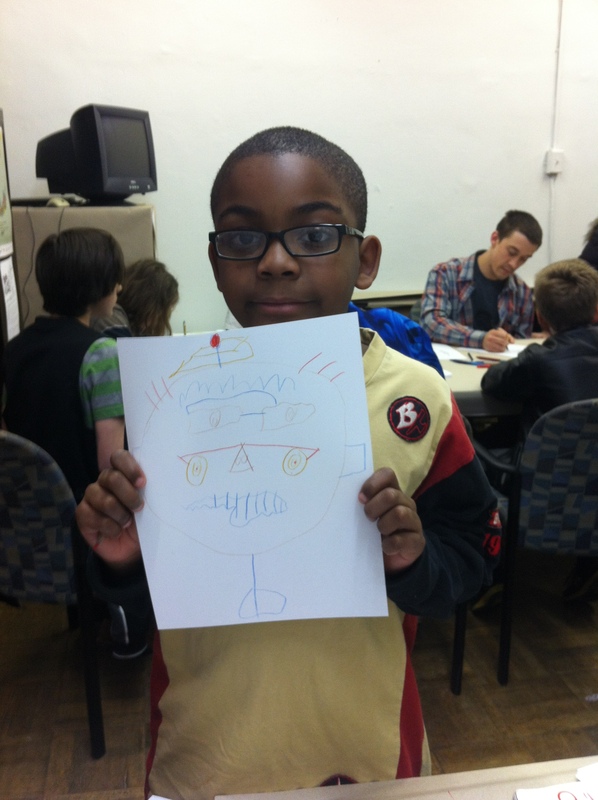 The chief approach to my process was by collaborating with the kids, trading off our comics frame by frame. 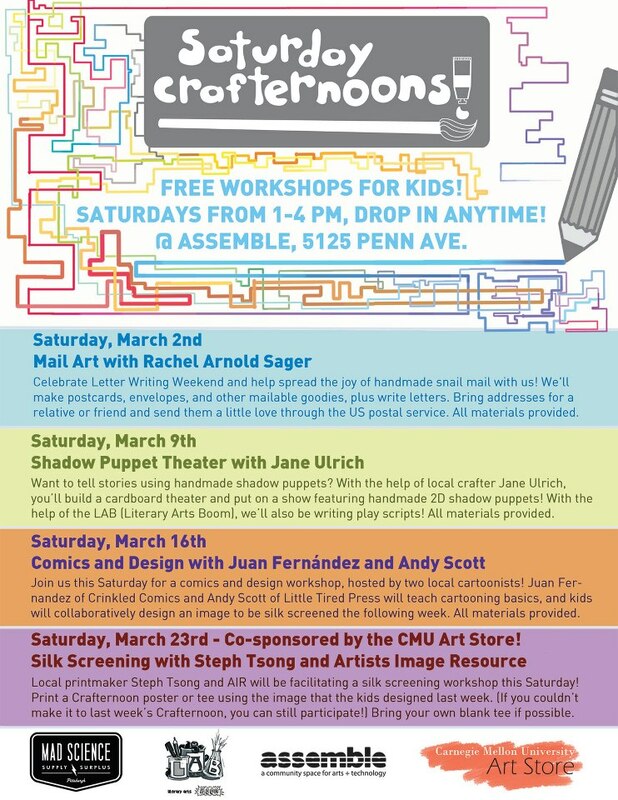 Next week’s Crafternoon will be a screen printing session with Steph Tsong and the friendly folks from the Artist’s Image Resource in Pittsburgh. Using the contributions of the workshops attendees, I put together a little poster for the kids to try their hand at printing. It was a blast to run a workshop like this. I hope to work with Assemble and similar organizations in the future to create spaces for kids to draw and work on comics fundamentals. If I could do this for a living, well, that’d be a dream come true!